Ernest Vaughan and Cathy McCann pause for a photograph at the Community Food Bank of New Jersey. The Food Bank assisted disaster survivors after Hurricane Irene struck the coast of New Jersey on August 28, 2011. Hillside, New Jersey, November 1, 2011, 1:58 p.m., Canon 5D Mark II, EF 24-105 mm f4.0L IS USM, f/4.0, 1/40 sec., ISO 6400. Photo by Christopher Mardorf / FEMA. Angela Gonzalez (left) and Zhicheng Wang (right), volunteers from Kean University, sort and pack donated food at the Community Food Bank of New Jersey. The Food Bank assisted disaster survivors after Hurricane Irene struck the coast of New Jersey on August 28, 2011. Hillside, New Jersey, November 5, 2011, 12:48 p.m., Canon 5D Mark II, EF 24-105 mm f4.0L IS USM, f/4.0, 1/40 sec., ISO 6400. Photo by Christopher Mardorf / FEMA. Aisles of palletized food await pickup at the Community Food Bank of New Jersey. The Food Bank assisted disaster survivors after Hurricane Irene struck the coast of New Jersey on August 28, 2011. Hillside, New Jersey, November 1, 2011, 1:26 p.m., Canon 5D Mark II, EF 24-105 mm f4.0L IS USM, f/5.6, 1/60 sec., ISO 6400. Photo by Christopher Mardorf / FEMA. A fork lift moves pallets of food at the Community Food Bank of New Jersey. The Food Bank assisted disaster survivors after Hurricane Irene struck the coast of New Jersey on August 28, 2011. Hillside, New Jersey, November 1, 2011, 2:01 p.m., Canon 5D Mark II, EF 24-105 mm f4.0L IS USM, f/5.6, 1/60 sec., ISO 6400. Photo by Christopher Mardorf / FEMA. Jars of peppers await pickup at the Community Food Bank of New Jersey. The Food Bank assisted disaster survivors after Hurricane Irene struck the coast of New Jersey on August 28, 2011. Hillside, New Jersey, November 1, 2011, 1:29 p.m., Canon 5D Mark II, EF 24-105 mm f4.0L IS USM, f/5.6, 1/100 sec., ISO 6400. Photo by Christopher Mardorf / FEMA. Volunteers from Seton Hall University sort and pack donated food at the Community Food Bank of New Jersey. The Food Bank assisted disaster survivors after Hurricane Irene struck the coast of New Jersey on August 28, 2011. Hillside, New Jersey, November 5, 2011, 1:03 p.m., Canon 5D Mark II, EF 24-105 mm f4.0L IS USM, f/5.6, 1/60 sec., ISO 6400. Photo by Christopher Mardorf / FEMA. Volunteers from Kean University sort and pack donated food at the Community Food Bank of New Jersey. The Food Bank assisted disaster survivors after Hurricane Irene struck the coast of New Jersey on August 28, 2011. Hillside, New Jersey, November 5, 2011, 12:44 p.m., Canon 5D Mark II, EF 24-105 mm f4.0L IS USM, f/4.0, 1/30 sec., ISO 6400. Photo by Christopher Mardorf / FEMA. A pallet of pumpkins awaits pickup in the warehouse of the Community Food Bank of New Jersey. The Food Bank assisted disaster survivors after Hurricane Irene struck the coast of New Jersey on August 28, 2011. Hillside, New Jersey, November 1, 2011, 2:11 p.m., Canon 5D, EF 70-200 mm f2.8L IS USM, f/2.8, 1/30 sec., ISO 1600. Photo by Christopher Mardorf / FEMA. A pallet of bread awaits pickup in the warehouse of the Community Food Bank of New Jersey. The Food Bank assisted disaster survivors after Hurricane Irene struck the coast of New Jersey on August 28, 2011. Hillside, New Jersey, November 1, 2011, 2:14 p.m., Canon 5D, EF 70-200 mm f2.8L IS USM, f/2.8, 1/50 sec., ISO 1600. Photo by Christopher Mardorf / FEMA. 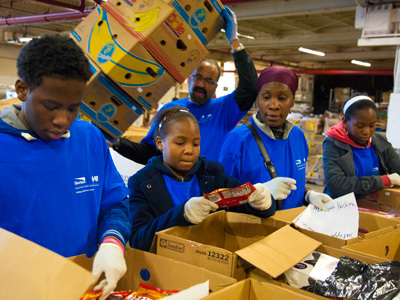 Volunteers from Horizon Blue Cross Blue Shield of New Jersey help sort and pack donated food at the Community Food Bank of New Jersey. The Food Bank assisted disaster survivors after Hurricane Irene struck the coast of New Jersey on August 28, 2011. Hillside, New Jersey, November 5, 2011, 12:35 p.m., Canon 5D Mark II, EF 24-105 mm f4.0L IS USM, f/5.0, 1/50 sec., ISO 6400. Photo by Christopher Mardorf / FEMA. Tractor trailer at the loading dock of the Community Food Bank of New Jersey. The Food Bank assisted disaster survivors after Hurricane Irene struck the coast of New Jersey on August 28, 2011. Hillside, New Jersey, November 5, 2011, 12:35 p.m., Canon 5D Mark II, EF 24-105 mm f4.0L IS USM, f/22.0, 1/1250 sec., ISO 5000. Photo by Christopher Mardorf / FEMA. A pallet of produce awaits pickup in the warehouse of the Community Food Bank of New Jersey. The Food Bank assisted disaster survivors after Hurricane Irene struck the coast of New Jersey on August 28, 2011. Hillside, New Jersey, November 1, 2011, 2:02 p.m., Canon 5D Mark II, EF 24-105 mm f4.0L IS USM, f/6.3, 1/125 sec., ISO 6400. Photo by Christopher Mardorf / FEMA. A pallet of Ritz Crackers awaits pickup in the warehouse of the Community Food Bank of New Jersey. The Food Bank assisted disaster survivors after Hurricane Irene struck the coast of New Jersey on August 28, 2011. Hillside, New Jersey, November 1, 2011, 1:29 p.m., Canon 5D Mark II, EF 24-105 mm f4.0L IS USM, f/6.3, 1/125 sec., ISO 6400. Photo by Christopher Mardorf / FEMA. A fork lift moves a pallet of food in the warehouse of the Community Food Bank of New Jersey. The Food Bank assisted disaster survivors after Hurricane Irene struck the coast of New Jersey on August 28, 2011. Hillside, New Jersey, November 1, 2011, 2:01 p.m., Canon 5D Mark II, EF 24-105 mm f4.0L IS USM, f/5.6, 1/60 sec., ISO 6400. Photo by Christopher Mardorf / FEMA. A pallet of butternut squash awaits pickup in the warehouse of the Community Food Bank of New Jersey. The Food Bank assisted disaster survivors after Hurricane Irene struck the coast of New Jersey on August 28, 2011. Hillside, New Jersey, November 1, 2011, 12:44 p.m., Canon 5D Mark II, EF 24-105 mm f4.0L IS USM, f/5.6, 1/60 sec., ISO 6400. Photo by Christopher Mardorf / FEMA. A pallet of butternut squash awaits pickup in the warehouse of the Community Food Bank of New Jersey. The Food Bank assisted disaster survivors after Hurricane Irene struck the coast of New Jersey on August 28, 2011. Hillside, New Jersey, November 1, 2011, 1:44 p.m., Canon 5D Mark II, EF 24-105 mm f4.0L IS USM, f/4.0, 1/50 sec., ISO 6400. Photo by Christopher Mardorf / FEMA. A bin of baked bread awaits pickup in the warehouse of the Community Food Bank of New Jersey. The Food Bank assisted disaster survivors after Hurricane Irene struck the coast of New Jersey on August 28, 2011. Hillside, New Jersey, November 1, 2011, 1:34 p.m., Canon 5D Mark II, EF 24-105 mm f4.0L IS USM, f/7.1, 1/100 sec., ISO 6400. Photo by Christopher Mardorf / FEMA.